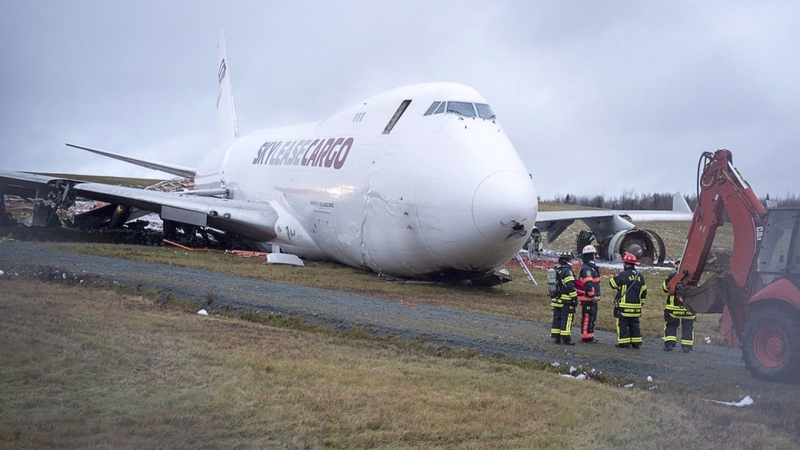 A 747 cargo plane skidded off a runway while landing at Halifax Stanfield International Airport early Wednesday, leaving a trail of debris and sending four crew members to hospital, according to the airport’s official Twitter account. The runway where the incident took place is closed until a safety review is conducted by officials, airport spokeswoman Theresa Rath Spicer told CTV’s Your Morning on Wednesday. But the airport’s main runway has been re-opened on a limited basis — the airport had activated its emergency operations centre which meant temporarily suspending all flights coming in or out of the airport. 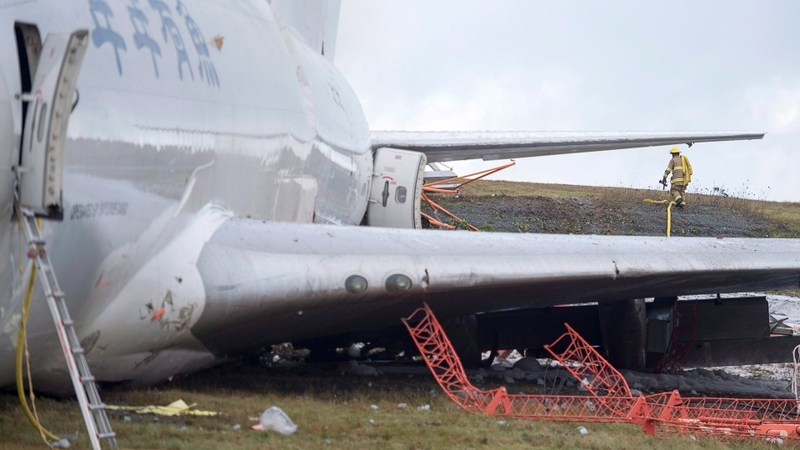 Spicer said, after the SkyLease Cargo plane skidded off Runway 14-32 just after 5 a.m., the crew members on board Flight KKE 4854 were taken to hospital with minor injuries. It is not yet clear what caused the incident, she added. Flights are expected to be “significantly impacted” by the incident and Spicer urged passengers to check with their airlines for specific delays or changes to their flights. 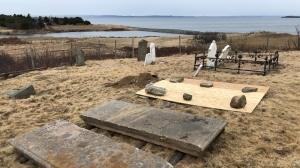 Officials said the flight had been travelling from Chicago to Halifax before the incident occurred, CTV Atlantic’s Natasha Pace reported Wednesday. As part of the airport’s emergency procedures, RCMP, local police, Halifax fire services and medical response teams were called in. Citing privacy concerns, Emergency Health Services spokesman Remo Zaccagna wouldn’t comment on the precise nature of the injuries, but said two ambulances were sent to the airport along with a supervisory unit. Hours after the incident, the plane was still sitting on a slight incline far off the runway and within about 50 metres of a fence that marks the perimeter of the airport boundary. The landing gear wasn’t visible, the nose of the white aircraft had sustained moderate damage and the underside of the plane appeared to be cracked and heavily damaged. Two of the engines also appeared to be heavily damaged with the two other engines completely sheared off. 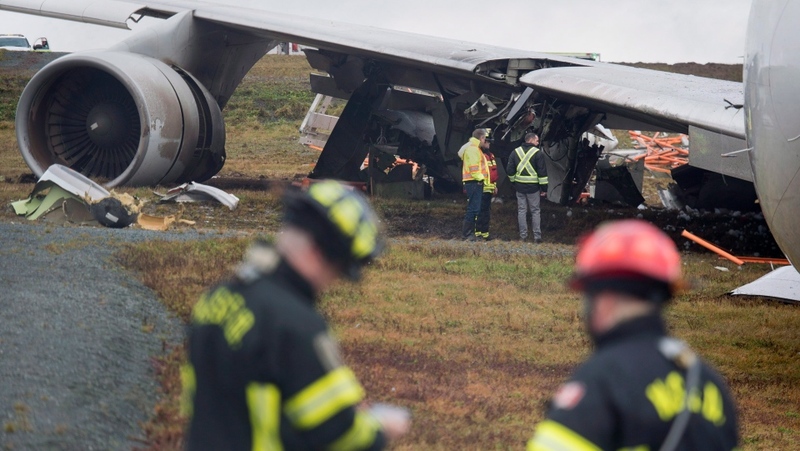 District chief Gord West said the Halifax fire department had assisted the airport's fire unit and confirmed there was no fire resulting from the crash. He added crews had sprayed the aircraft with foam. 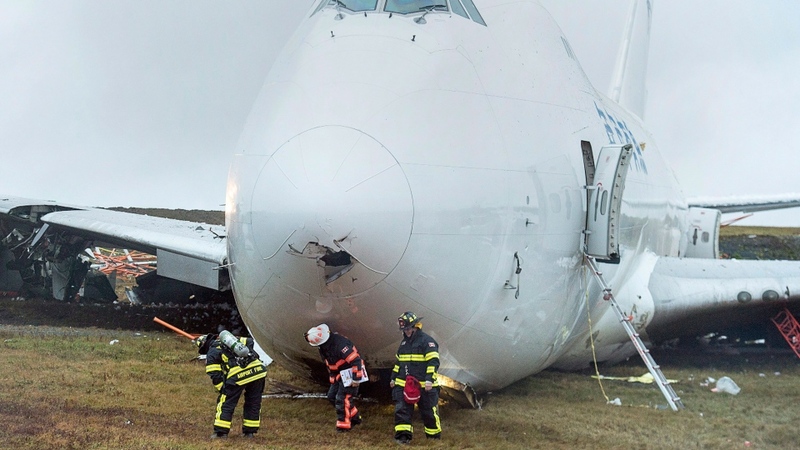 It said SkyLease's 747-400 aircraft had the capacity to carry up to 120 tonnes of Nova Scotia seafood to China.